Produzione e vendita di piastrelle in gres rosso, cottoforte, rivestimenti e pavimenti in bicottura e gres porcellanato. After grouting, it is fundamental to clean the surface well. 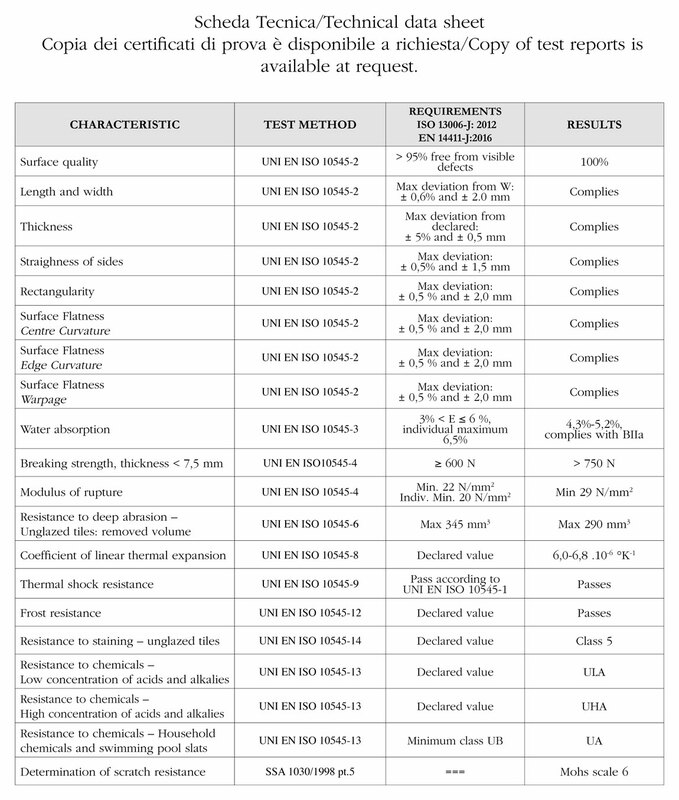 – Grout and general residue from laying. – Building site dirt and superficial residue of material. Final cleaning to be performed at complete drying of grout, as specified on manufacturer technical data sheets. Tools: Flat brush or single-brush machine with green disc. Liquid vacuum cleaner. machine with green disc or with a flat brush. Collect the residue with a cloth or with a liquid vacuum cleaner. Lastly rinse with water. In order to fully remove residues of epoxy grout, we suggest using specific detergent FILA CR10 or FILA PS/87. – Apply directly to dirty surface using a flat brush, perfectly covering any grout residue. – Repeat all above steps in case of stubborn residues. Having carefully washed the material after laying, it is possible to proceed with the protection. FILAMP90 is the best stain protection for porcelain tiles. It doesn’t alter the natural colour of surfaces and it is certified as suitable for use on food contact surfaces. 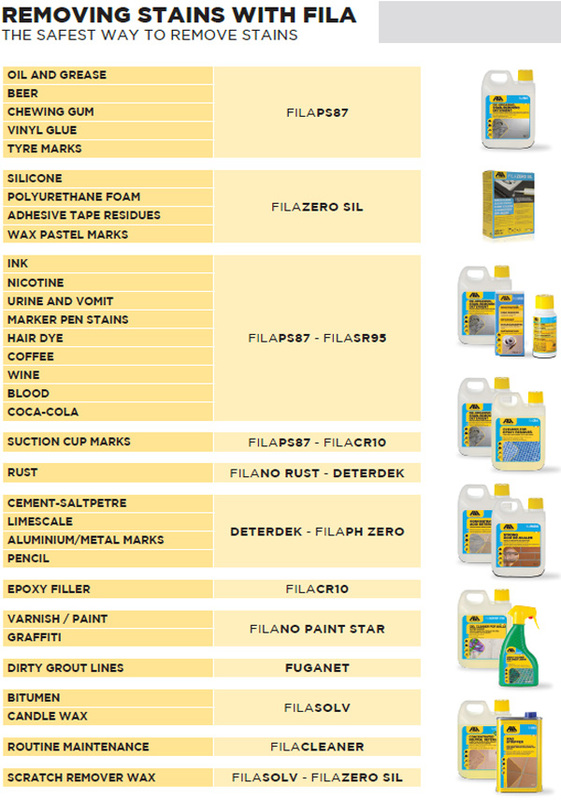 to spread an even coat of FILAMP90 onto a clean and dry surface. 2. After 24 hours, when the floor is dry, remove the excess using a single-disc professional cleaner (white or beige disc) or a household polisher fitted with felt pads. 3. Stubborn residues can be removed with a cloth dipped in FILASOLV. of dirt. It adds shine to the material, enhancing its natural colour. The product provides stain protection for the surface and also the cementitious grouting. pad. We recommend applying the product 2/3 m² at a time. The surface is ready for use after 8 hours. the treatment at the same time. Dilute one cap of FILACLEANER in a bucket of lukewarm water and rub regularly. No rinsing is required. Encrusted dirt (beverages, food): FILAPS87 eliminates encrusted dirt on the surface. dirt and then rinse with plenty of water. For a deeper clean, dilute to 1:5. Prepare a lean mixture with washed grainy sand without clay; lay a thin stratum of sand between the laying bed and the support; the laying bed has not to be less thick than 2 cm. for the inside floors and than 4 cm. for the outside floors. Dredge the surface with cement, then lay the tiles. Before the setting of this cement, beat the tiles in order to get a good penetration of them. However, to avoid the umpleasant inconvenience of the efflorescences owing to the types of sand used, we advise fixing with fix-adhesive on dry cement bed. The laid tiles must not be in contact. It is necessary to leave a space of 1-2 mm. between the tiles. As to the outside floors, it is very important to putty the spaces in order to avoid as far as possible the water seepage in the floor rough. As to the inside floors, consider expansion joints (regarding the laying bed too) of 25 mq. at least and of 5 ml. at the most. For the outside floors and for the localities which have severe weather, the floor surfaces which are delimited by elastic joints have not to be superior to 2-3 mq. If the outside floor is over habitable rooms; it is important to well impermeabilizie the substrusture; at the conjonction of the floor with a wall, the impermeabilization shall concern the wall too for at least 15 cm. in height. At the lowest of the waterproofing layer, a downflow of the water which could be percolated from the floor has to be considered. Leave then an empty space of cm. 1-2 near the pillars, the plinths and the walls. This space must be filled by a permanently and elastic material. The outside floors have to be a small gradient (1%) for the quick disposal of the rainfall water. The load bearing structure must have the same gradient of the floor in oder to carry out a laying bed of constant thickness (4-5 cm). Do not lay the tiles on a too fresh cement support which has not had its maximum shrinkage. It is better not to carry out the tile laying when it is too hot (+35° C) or too cold (-5° C). The outside floors have to be protected from the wind, the solar rays and the rain during the firts days after the tile laying. Avoid the passage on the floor for 6-7 days after the laying. Among the most common defects due to a poor installation, cna be found moulds or efflorescences. 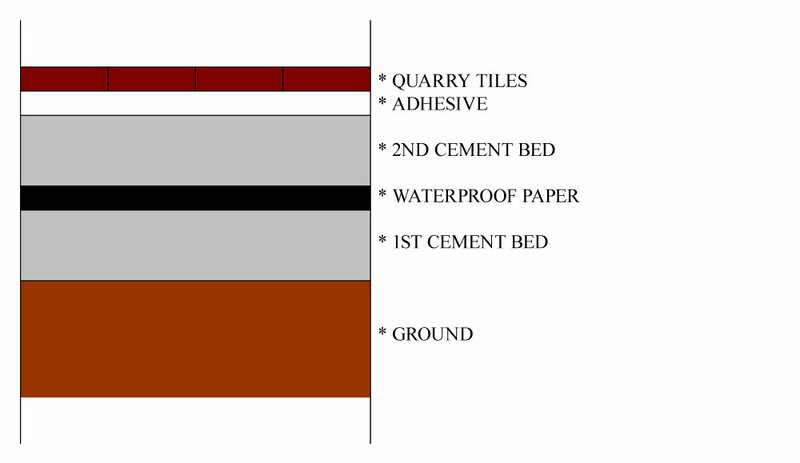 In case that material is outdoor installed with high ground humidity conditions, we strongly recommend to interpose inbetween the two existing cement beds a waterproof sheathing (bituminous paper or similar) in order to avoid underneath moisture to continously raise up to the surface showing efflorescence. The white stains whitc appear on tile after laying are salts. This is a natural event which doesn’t arouses any worry and which is non attributable to our tiles. In fact our tiles cannot hold water+soluble salts because of the quality of the clay and the hight temperature of firing. The saltsis melted into the water of mixture and reaches the surface through the pores of the tile, where; in contact with the air, the water evaporates while the salt remains on the surface of tile becoming white stains. These salts appear preferably in parallel as the studs, as, here the thickness is higher and so the tile is more absorbent: for this reason there is the higher salts strenght. This event stops when the mortar is completely dry: the necessary time varies from some days to several months according to the climate. When the mortar is completely dry, you can clear the tiles using an acid solution (10% nitric acid and 90% water). For taking away the more resisting stains, you can use the saw dust wet with this acid solution. Immediately after use, the saw dust must be taken away and the tiles must be washed with abundant water. In order to reduce the absorption of the tiles we suggest to use polishing wax, but, be careful, don’t use linseed oil or other unglazed floor polishing wax before the mortar is dry and the salts are completely appeared on surface throuch the pores of the tiles. In fact the above products can stop the pores of the tiles and obstruct the emission of the salts melded into the water of mixture. Equipment: Single-brush machine with green disc, liquid vacuum cleaner, flat brush, cloth. Procedure: Wet the surface then evenly apply the Deterdek solution. Use a single-brush machine with green disc or floor brush with cloth to clean vigorously. (When this is done by hand, the cloth should be rinsed often in the washing solution). Rinse thoroughly with clean water, if necessary using a liquid vacuum cleaner. Procedure: Evenly apply Fila CR10 detergent and leave for about 20-30 minutes. Use a single-brush machine with green disc or floor brush with cloth to clean vigorously. Rinse thoroughly with clean water, if necessary using a liquid vacuum cleaner. Recommended for floors exposed to the elements (rain, snow, etc.) and for the prevention of water absorption. Equipment: Large flat paintbrush, wax applicator fleece pad or other suitable method. Procedure: Evenly apply one coat of undiluted Fila ES/82 (solvent-based water repellent), with a large flat paintbrush making sure the material is completely soaked. The surface is ready for use after 12 hours. Procedure: Evenly apply one coat of undiluted Fila ES/82 (solvent-based water repellent), with a large flat paintbrush making sure the material is completely soaked. 24 hours after application, evenly apply one coat of undiluted Fila Fob (solvent-based oil repellent), with a large flat paintbrush making sure the material is completely soaked. The surface is ready for use after 12 hours. The aim of ordinary maintenance is to remove dirt, scuff marks, etc. It should be carried out regularly and it is essential that the methods and products used do not harm the protection ensured with the initial treatment. Maintenance should be calibrated to suit need. For ordinary maintenance we recommend washing with Fila Cleaner, appropriately diluted in water (about half a glass in 5 l of water). No rinsing is required. For extraordinary maintenance, in other words when there are more stubborn stains, we recommend using the degreasing, stain removing detergent Fila PS/87. With this product, the surface must then be rinsed.